A romantic way to introduce the rose gold trend into your look. 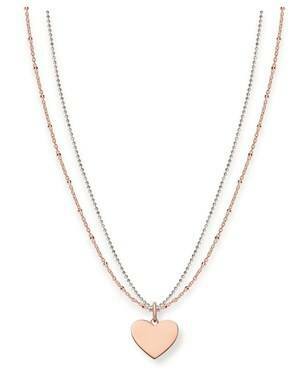 This stunning Thomas Sabo necklace can be engraved making it the perfect personal gift for a loved one this season. Hi, I would like to engrave the letter 'E' into the heart of this necklace for my girlfriend Elizabeth, however when using the engraving service I am unable to customer the engraving by not having the option to choose a font or size, like I am abe to do on bracelets. I would be happy to order this product once I can customise the engraving. I have checked this and the engraving on all necklaces has this same problem.